A 10-day Adventure Quest cruise has been added to boutique Kimberley Quest's program of six, eight and 14-day cruises along northern West Australia's rugged Kimberley coastline next year. 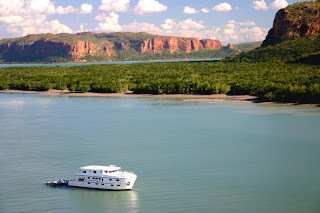 Releasing the 2012 itineraries for Kimberley Quest this week, Pearl Sea Coastal Cruises also announced 20 per cent discount earlybird deals for new bookings made between September 1 and January 31, on 8, 10 and 14-day cruises in 2012. The deal on the new cruise, for example, means the price is from $7200 per person instead of from $9000. Director, Lynne Ralston said that in recent years Kimberley Quest II skippers had discovered several secret spots that could be easily accessed by the stylish 18-passenger Kimberley Quest for a 10-day Broome-Broome trip. "We can explore many untouched places that we rarely have the opportunity to visit," she said. "While we have been operating cruises along the coast for 18 years we're still learning her secrets." The price includes cabin with ensuite, all chef-prepared meals served on the shady stern deck or in the air-conditioned lounge, full use of the vessel (that includes the spa pool on the forward deck) and guided land and water excursions. Departures are August 21 and August 30. The itinerary includes Cape Leveque, Buccaneer Archipelago, Dugong Bay, Yampi Sound, Talbot Bay, Montgomery Reef, Sale River, Raft Point, Doubtful Bay, Camden Harbour, Rothsway Water, Prince Regent River, Cathedral Falls and King Cascade, Camp Creek and Hanover Bay, Heywood, Champagny Island and Adele Island. Kimberley Quest II offers four cabin styles, all with ensuite facilities. Twenty-five departures -- listed as "expeditions" by PSCC -- across six itineraries are scheduled for 2012 in a season running from March 27 to October 8. Two of three eight-day fishing expeditions are booked out. Lead-in full fare prices are from $6,200 per person, twin share for the six-day Captains Quest, from $8345 for both the eight-day Northern Quest and Southern Quest, from $7.200 for the six-day Fishing Expedition and from $12, 095 for the 14-day Ultimate Quest. The 14-day itinerary is cruising between Broome and Wyndham, the Southern Quest is between Broome and Mitchell Plateau, the Northern Quest is between Mitchell Plateau and Wyndham and the Captains Quest is between Mitchell River and Hunter River. The Fishing trip is between Hunter River and Broome. Prices for cruises featuring Mitchell Plateau include a helicopter flight as well as light aircraft transfers to/from Broome. Contact: tel 08 9193 6131, email cruise@kimberleyquest.com.au or visit www.kimberleyquest.com.au.